Allgäu / Tel-Aviv (wige) Water from the Sea of Galilee and all brewing ingredients such as malt and hops from Germany and master brewers from Tel-Aviv and Missen in the Allgäu … that must be a special beer. The President of the rally, Wilfried Gehr, has now established that this is the case at the first rehearsal in Israel. “The beer is comparable to the Allgäu beer, but has a slightly stronger malt flavor, it tastes quite good.” The rally friendship beer will be served in four restaurants in Tel Aviv and Jerusalem starting in October. The total selling price, which in Israel is about twice as high as in Germany, flows to sick children. At the start of the Orient Rally in Oberstaufen, the participants of the rally got a special task called Sackweise Hopfen und Malz, which was sponsored by the Missener Schäffler-Brauerei, loaded into their vehicles. These beer ingredients then had to be carted on side roads across the entire Bosphorus to Istanbul, and then through the Asian part of Turkey and finally by ferry to Israel. In the small Alexander brewery near Tel Aviv hops and malt were then accepted by the local brewery boss Ori Sagy and the Allgäu brewers and brewery chefs Sebastian and Florian Grassl. 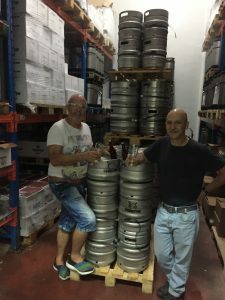 While the rallycross continued on via Jerusalem and the Dead Sea to the Jordanian desert, the three beer specialists then brewed the Orient Rallye Friendship Beer with German ingredients, water from the Sea of Galilee and brewing art from the Allgäu and Israel. 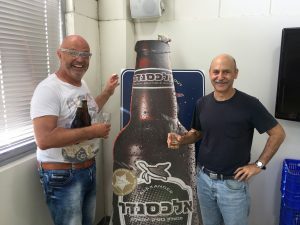 Ori Sagy of the Alexander Brewery and Israeli Rally President Orly Louk have been able to win over the owner of the “Bierbazzaar Israel” (www.beerbazaar.co.il) restaurants to serve the beer of friendship in their restaurants and the full sale price of 1000 liters of beer for children dissipates. The money will then go to the organization Shalva (www.shalva.org.il), which supports children with disabilities. The two breweries Schäffler in the Allgäu and Alexander in Israel want to further use the connection created by the rally for an exchange of experience and more. Maybe soon you will be able to buy Israeli beer through Schäffler Bräu and the Israelis will enjoy the good Schäffler beer in return.